It’s called “espírito de porco” in Portuguese: that sentiment of wanting to create trouble or cause damage to something or someone just for the sake of it. 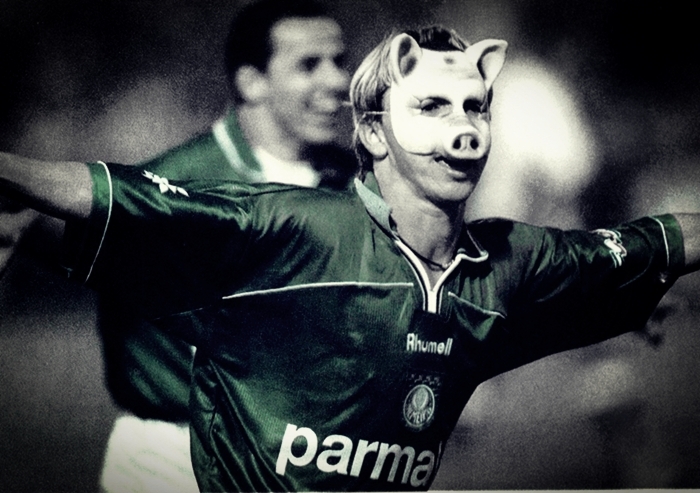 The pig is Palmeiras’ second, or rather “adopted” mascot (the official one is the parakeet; more on this in a future post) so it makes even the more sense to endorse the above-mentioned sentiment, even though no one in their right mind would say that Palmeiras and palmeirenses are in it “just for the sake of it”. No, we are talking about a unique opportunity to pull the carpet from underneath our greatest rival Corinthians. That’s a cause to embrace and songs will be sung for eons if Palmeiras succeed in this endeavour, ending the year putting the largest of smiles on the face of each and every one of us. More than ever – AVANTI PALESTRA! ps. yours truly will most likely make contributions in a live internet radio broadcast on Sunday, covering the last round of the Brasileirão. Check back for further info on this space.